The Georgia Attorney General’s Office has announced the approval of the strategic partnership and integration of DeKalb Medical and Emory Healthcare. The Georgia Attorney General’s Office has announced the approval of the strategic partnership and integration of DeKalb Medical and Emory Healthcare, solidifying the unity of the two health systems. With this final regulatory approval, it is anticipated DeKalb Medical will officially become a part of the Emory Healthcare system on September 1, 2018. The two health systems initiated their requests for a partnership in November 2017 through a formal Letter of Intent. The Federal Trade Commission approved the partnership in March 2018. The partnership application was then filed with the Georgia Attorney General’s Office, which has announced its decision. Both Emory Healthcare and DeKalb Medical have strong roots in the community and the state of Georgia. Emory has had a presence in DeKalb County for more than 100 years, with more than half of its employees residing in DeKalb and the surrounding vicinity. DeKalb Medical has been serving the region’s patients and families for more than 57 years. DeKalb Medical is a not-for-profit health system consisting of three hospital campuses with a combined 627 licensed beds. As part of the integration, DeKalb Medical’s hospital on North Decatur Road will be named Emory Decatur Hospital; DeKalb Medical Hillandale will be named Emory Hillandale Hospital; and DeKalb Medical Long Term Acute Care at Downtown Decatur will be named Emory Long Term Acute Care. DeKalb Medical has 55 practice locations throughout DeKalb and Gwinnett counties, more than 800 doctors on its medical staff in nearly 50 specialties and 4,000 employees. Its long term acute care (LTAC) hospital is the only LTAC in the U.S. with three Joint Commission Gold Seal Disease-Specific Certifications in respiratory failure, wound care and acquired brain injury. 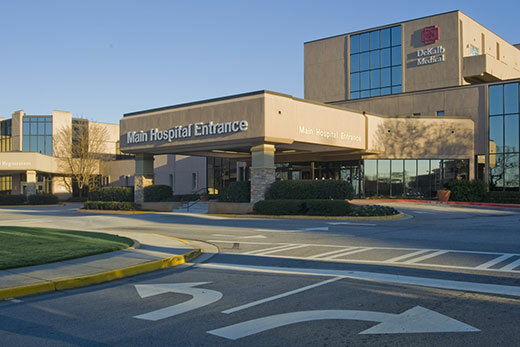 Emory Healthcare, a nonprofit organization, is the most comprehensive health system in Georgia, with seven hospitals and 200 provider locations in metro Atlanta and surrounding communities, including nearly 60 urgent care and MinuteClinics. It has more than 2,000 physician providers in 70-plus specialties, including more than 120 in primary care. With an additional 23 regional affiliate hospitals, Emory Healthcare has a footprint in more than 40 counties throughout the state.